emPOWER Africa – Part 2: Every Cloud Has a Silver Lining: It’s Called Mauritius! In the previous emPower Africa article, we talked about how Africa is trembling its way to economic growth, and we came to the conclusion of developing the energy sector being Africa’s ticket to economic and social prosperity, or more properly a better Africa, and that a better Africa would only happen if both government and investors unite efforts to develop the continent’s huge electricity capacity/need. Now this might seem very difficult — some would even think it’s impossible — I mean: we’re talking about a continent with 600 million people who lack access to electricity — that’s insane! Well, hold on “pessimistic” people, we have thought of you! Because in this article we are bringing-up a success story inside Africa: the Mauritius miracle or “how to make a big success of a small economy”. Availing a political stability, a good governance record and an open/flexible regulatory system, Mauritius is also known for being one of the few countries in the world adhering to what we call: the “transitioning” energy generation model! What kind of “transition” are we talking about? Haven’t you heard yet? The world is transitioning from an industrial age model of electricity generated from large-scale power plants (the current model used in most countries) to a blended energy model that includes distributed electricity generation from both local and regional renewable energy projects. Still, not all countries are going with this flow; some are faster than others in implementing this new energy model, and Mauritius is definitely one of the fastest! In fact, the government’s energy policy in Mauritius is very eco-friendly as it highly promotes the use of renewable and clean energy to reduce the country’s dependence on fossil fuels and lower greenhouse gas emissions whose effects are disastrous (read our article “Why Green Energy?” to know more). The government also has quite an impressive roadmap for its energy generation model by increasing the use of renewable sources of energy from 22% (current percentage) to 35% by 2025. It is willing to do so through launching wind farms, solar energy, biomass and waste-to-energy projects. Mauritius is currently deriving its renewable electricity generation from hydro, wind, landfill gas and solar while maintaining bagasse (sugarcane waste) as primal source of renewable energy (16%) with a total contribution of 22 % in the primary energy supply. Besides, the Mauritian government is constantly looking for international competitive bidding to carry out its energy projects and is concentrating a “joint-ventures” strategy by encouraging joint ventures between the local private sector and international firms: by combining the local competence with the foreign expertise the country is hoping to meet its development objectives for the energy sector by 2025 and to be one step closer to the futuristic energy model. Moreover, The Central Electricity Board (CEB), the main power utility in Mauritius, stated that it’s planning to upgrade the grid absorption capacity of intermittent energy from 148 MW to160 MW by 2018. Hang on! We have more! The government is also undertaking major legal and institutional reforms in the power sector. For instance, in 2016 the Mauritian government created MARENA (The Mauritius Renewable Energy Agency) as a way to assert that it is taking the development of renewable energy very seriously. Later, in 2017 the government created a Utility Regulatory Authority to regulate and control electricity, potable water and wastewater. Another accomplishment is the “Energy Efficiency Act” that is aimed to perform product labeling operations plus the importation of specialised energy efficient equipment. Still think emPOWERING Africa is impossible? Well think again! Wejden Khachaà is a Marketing/Finance Bachelor who is passionate about blockchain and it’s power to change the world. It is no secret that the economic growth and electricity supply of any given country are highly correlated, and if Africa is to reach the economic prosperity it hopes for, it would definitely need a huge amount of power to fuel the increasing demand for electricity it is facing today! Africa has been starving for electricity for a long time now, and just by skimming over some macroeconomic facts, it becomes clearly perceptible that the region’s energy sector is considerably underdeveloped, and that’s a serious problem! From deficient energy access, to limited amount of capacity installed to poor electricity consumption, an overall power system in most African countries is weak and unsustainable! For others, there’s no system to be found at all. Further, the fact that both residential and industrial sectors in Africa suffer from electricity shortages, this depicts that most of its countries are literally struggling to sustain GDP growth! And so, fulfilling the economic and social prosperity of Africa lies upon the ability of its government and investors to develop the continent’s huge electricity capacity! Looking at the diagram below, we can see that countries with electrification rates that are less than 80 % of the population consistently suffer from low GDP (per capita), and that only those having natural resources in abundance (Angola, Botswana, Gabon) and electrification rates of less than 80 %, do have a GDP greater than $3,500. And yet they still score low in terms of economic prosperity. From an electricity-access perspective, sub-Saharan Africa’s situation is the worst worldwide: With 13 % of the world’s population, and only 48 % of them having access to electricity. That makes around 600 million people lacking access to electricity. And only seven African countries (Cameroon, Côte d’Ivoire, Gabon, Ghana, Namibia, Senegal and South Africa) have electricity access rates exceeding 50 %, while the rest of the region has an average grid access rate of just 20 %! And even when there is access to electricity, there may not be enough to go around. From an electricity-consumption perspective, Africa’s rates are far below everyone else. For instance, average electricity consumption in some African countries, excluding South Africa, is only about 150 kilowatt-hours per capita. That’s like a fraction of the consumption rates in Brazil or India. Still, when we look closely, it’s obvious that there is a lot of potential for growth in the African electricity sector; one that explores how power demand is rapidly evolving, along with the associated supply requirements and costs of supplying the needed power, plus the options available to manage the expense and requirements of ensuring that new capacity is being built. Thus, Africa has an extraordinary opportunity to boom economically in no time! All that Africa really needs, is a dynamic model of power that would enable it to do so: Electrify Network! ENERGY; that magical intangible element, whose access is fundamental to fulfilling basic social needs, driving economic growth and fueling human development, should primarily be considered as a human right: Every living person on EARTH is a “stockholder” of its natural fortunes, air, water and most definitely, energy! However, what we refer to now as “modern energy”; electricity, natural gas, modern cooking fuel and mechanical power, is being industrialized, then merchandised in forms of services adhered to a standardized and centralized model of distribution. 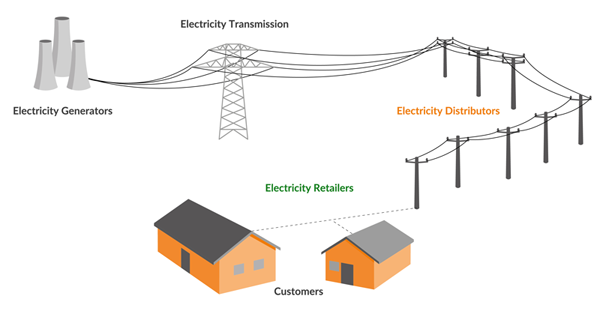 Under the current centralized model, electricity is mainly produced at a large-scale through centralized generation facilities, These facilities are usually located away from end-users and connected to a network of high-voltage transmission lines. The electricity generated by centralized generation facilities is distributed through the electric power grid to multiple end-users. In other words, this model of energy simply depicts vertically-integrated utilities sat in the middle of the system run by energy providers, or rather say “centralizers”: they decide where and when to build generating capacity; they decide how to bridge the distance between generators and loads; they kept the system in balance through the deft application of the levers available to a centralized controlling entity: like we said, “energy centralizers”. While other “progressive utilities” and regulators try to position themselves as “consumer-focused”or “consumer-centric”, but the truth is, even the most consumer-friendly ones are only reformulating the same narrative, aligned with their objectives: amass as much refined databases of “loyal customers”. Meanwhile, consumers are fed a steady diet of price and product/service, plus the cost of energy security that can be counted in terms of control, certainty and economic independence. And yet, as vital as these services are, over 1 billion people do not have access to reliable, affordable electricity; they are often forced to turn to polluting, hazardous, and expensive solutions like kerosene, charcoal and diesel in order to fuel their lives. Nevertheless, even for those who can access it via grid extension, it’s really slow: studies have shown that energy access via traditional power plants alone is too time-intensive: the average time it takes for a World Bank power plant project is 9 years,and even when the centralized grid is available, many families cannot afford to connect. For that we believe in the potency of blockchain technology in moving the power balance from centralized power authorities and suppliers to consumers. How? by simply appending the blockchain technology into the magical recipe; The Distributed Energy Resources (DER), a promising market that operates in solar photovoltaic systems (PV),batteries, microgrids and embedded networks. By combining these two potentials, we get our SUPER NOVA: “blockchained energy” for everyone! And it is not only about controlling the cost of energy consumption, it’s the divine incarnation of a great social impact: people having access to energy supplies that are more sustainable, more socially-responsible, more local, more resilient and more democratic. The time has now come for a basic industry like the energy to get revolutionized, or more properly “blockchained”, we hope for a new model of energy trading that strips control from the hands of central players and puts it in the hands of everyday consumers, for a co-created energy future. Starting with facts, in the last 50 years, we’ve managed to double our population, triple the amount of food and water we use, and quadruple the use of fossil fuels derived products. Vast quantities of fossil fuels have been used to power the economy and deliver unprecedented affluence to huge numbers of people, a population that is expected to reach ten billion by the end of the decade according to the UN predictions. For that matter, a universal question is arising: How is the world going to cope with this ever growing man-made global warming? especially that the greenhouse effect we are experiencing goes up roughly in proportion to the total amount of carbon dioxide that global society emits — cumulatively.And besides, how are we going to manage covering our energy needs, as global population continues to grow, and that the limited amount of fossil fuels already begun to diminish? ANSWERS, anyone? More recently, global warminghas become undeniably important with widespread melting of ice, noticeable climate changes, and rising sea levels. This is now recognized by nearly everyone as caused by greenhouse gases, (mainly carbon dioxide), produced by burning fossil fuels such as petroleum, coal, and natural gas. This current situation requires an immediate rebuilding of our entire energy infrastructure. Note that there are plenty of eco-friendly ways to convert energy without fossil fuels, and many of are being used, but not nearly to their full potential. We all must take actions and switch to green energy resources, such as solar power, wind power, hydroelectric power, hydrogen power, thermometric, and other renewable power sources. Unfortunately, global warming is not our only concern. 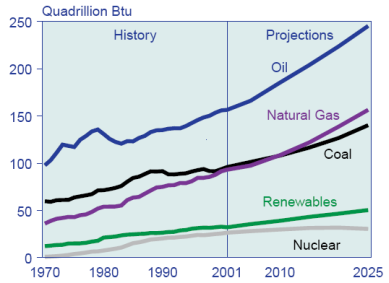 The global supply of fossil fuels is not as plentiful as it may seem today, compared to an increasing trend in the world energy consumption. This is mainly due to two factors: the growing world population and the growth of developing countries. The world population has been increasing at a more dramatic rate than it ever has been. -We keep saying this over and over, so people can see how very serious the situation is! — More people means more energy consumption, and more energy consumption, if we stick to fossil fuels as the major resource, means less time until we run out of fossil fuels. On the other hand, developing countries are major contributors to the increasing amount of production of energy: since these latter are in the process of becoming industrialized, they are consuming more energy than industrialized countries; they may have not yet mastered efficiency, resulting in both more consumption and more waste. All of this leaves us no choice but to adopt a green energy based system , the development of which requires only resources that we already have in abundance. Good news is that Electrify has already thought of such system that entirely shifts electricity generation away from fossil fuels, to more sustainable energy sources in an economically profitable way. Let’s preserve the Earth for our descendants, let’s go GREEN y’all ! What Would Life Be Like Without Electricity?